UPDATE: In November 2017, Delson was released from prison, but has restrictions on speech and movement. He is not allowed to leave the country nor give public declarations about his case. Delson Guarate is the mayor of Mario Briceño Iragory and a leading figure in Voluntad Popular, Venezuela’s main opposition party. 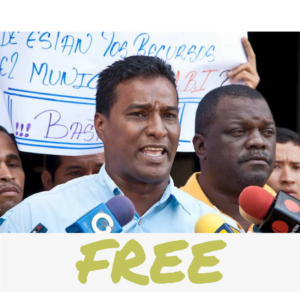 He was arrested on August 31, 2016, by the Bolivarian Intelligence Service (Sebin) and charged with “financing terrorism and engaging in criminal association.” It is believed he was arrested to stop him from participating in a mass public protest scheduled for the next day. Delson’s health has deteriorated since his imprisonment. On September 12, 2016, Delson was rushed to a military hospital after suffering from internal bleeding. On November 16, he was transferred back to the hospital due to acute gastritis. Lend your voice and share a solidarity tweet to help #SetThemFree!